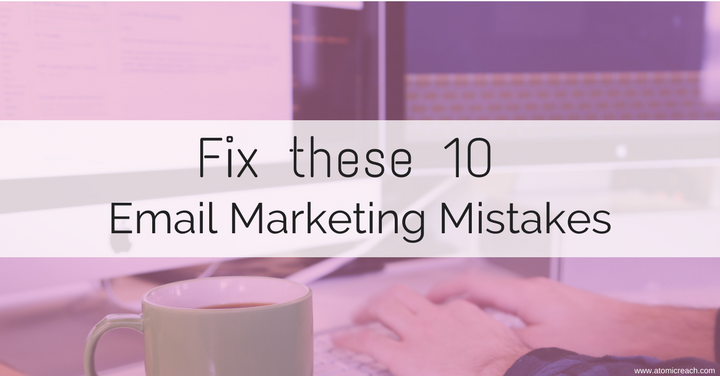 Even the most practiced and experienced marketers can make simple mistakes. They’re often easily overlooked and very simple to remedy, but they’re the kind of mistakes that can cost people a whole lot of traffic. Every marketer should be aware of the following mistakes, and take immediate steps to rectify and stay on top of them. It’s all too easy to become consumed with new trends, that you can forget to pay attention to the solid foundations of a marketing campaign, or you can let little details slip through the net. When someone has browsed your site but hasn’t bought anything, they need to receive a different message to the person who has made a purchase. You lose a customer’s interest if you ask them to make a purchase when they have already done so, so make sure you’re running a healthy email marketing campaign by using a reputable platform like Mail Chimp or Litmus. While you may be desperate to build your email lists and drive traffic your way, you may be tempted to buy some contact lists and send emails to those addresses. However, as these recipients haven’t consented to giving you their information, you will appear untrustworthy, and this will actually turn people off visiting your website. It’s much better to build your email lists organically via resources like Reach Mail or Active Trail. Sending bland emails that look drab and don’t contain anything exciting or any kind of personality won’t endear your business to potential customers. Using a proof reader or editor such as those found at Essay Roo can help make your content stand out, as can services that are well-equipped to inject some sparkle such as Mad Mimi. After you’ve promoted a new release, whether for a book or a new product, it can be hard to know how to proceed. This is where it becomes a good idea to start a campaign along the lines of a newsletter, so you aren’t forgotten about. No matter how much of a rush you’re in, there’s no excuse for sloppy grammar or spelling errors in the emails you send out. Any mistakes you make just show that you are not a business that pays attention to details, and you seem incompetent. Using an editor from a site like UK Writings helps you start on top of any mistakes. Make sure your emails are substantial, and contain enough words to actually have some relevance and provide them with real information; otherwise your emails become an irritant. You can stay relevant by hitting word count targets with Easy Word Count. As people skim through their emails quickly, if they open a screen of paragraph after paragraph of text, your message will quickly be sent to trash. While content is of utmost importance, making sure your emails are aesthetically pleasing is also important. Some email marketers use the same subject line throughout a campaign, which can run for weeks. This is highly ineffective, and you would be much better off thinking of a catchy and appealing subject line to really draw people in to your message. There are plenty of ideas for off the wall subject headings Academized. You need to review which emails are effective and which are not if you really want to drive traffic to your site. That way you can eliminate the messages that don’t work, and maximise the ones that do. Without analysing the results of emails, it’s impossible to know how to improve. Overall, an email marketing campaign is undeniably important to every business, and by avoiding the mistakes listed above, you can drive traffic to your site and amass thousands of new customers. About the Author: Gloria Kopp is a digital marketer and an elearning consultant from Manville city. Now she works as a content manager at Boomessays company. Besides, she is a regular contributor to such websites as Engadget, Studydemic, Huffingtonpost etc. Read her latest post about Rushmyessay review.